A class at 1440 Multiversity. There are 1,440 minutes in day. Joanie Kriens started thinking about that one day while in the midst of a few self-aware moments gardening in her backyard. Out of this, Joanie and her husband Scott Kriens had the name for their new charity, 1440 Foundation, which "aims to improve the state of the world… one person, one relationship, one connection, and one minute at a time." Tech wealth, and the philanthropy that flows from it, has come in waves over the past few decades. While companies like Facebook and Google get all the attention these days, an earlier era of tech entrepreneurs made their fortunes creating hardware and software. Scott Kriens, who made his wealth in computer networking equipment, is a case in point. He's been part of the action in Silicon Valley for over 30 years. Now, along with Joanie, Kriens is focusing more on philanthropy. After graduating from CSU Hayward, Kriens rose through the ranks of Silicon Valley. He co-founded StrataCom in 1986, which was eventually acquired by Cisco Systems. Kriens is currently chairman of the board of Juniper Networks in Sunnyvale, California. Kriens is no billionaire. But like a lot of winners in Silicon Valley who stay out of the spotlight, he's done well enough to give in a significant way. And, like other philanthropists, he and Joanie have done quite a bit of thinking about how best to do that. In a recent conversation, Kriens expressed gratitude for all his success in Silicon Valley, but also says he wishes he had other skills when he was coming up. Building “authentic, vulnerable and transparent relationships” is something he wished he knew how to do better back then, and is something that he and Joanie champion now. Kriens had a bunch else to say when I spoke to him about how the family's charitable strategy has shifted from writing checks to an operational role in the cause they care most about. The couple got their feet wet in philanthropy in 2010 when they founded 1440 Foundation purely as a grantmaking operation. The central premise guiding them was that being in true and authentic relationships is essential to all we do in life, and yet, it's also something for which we receive very little training. This seemed like an area where philanthropy could make a difference. Kriens and Joanie spent time hunting down leading actors and teachers in this space, and then began making grants through their foundation. Grantees through the years have included GirlTrek, a "peer network and a growing grassroots movement of thousands of African-American women and girls who are committed to walking for better health," and the Center for Mind-Body Medicine. Learning to be in strong, meaningful, and authentic relationships—with ourselves, with each other, and with the world around us—is the most important work we can do. The goal of 1440 Multiversity is to help each of us craft and live more integrated lives—both personally and professionally. 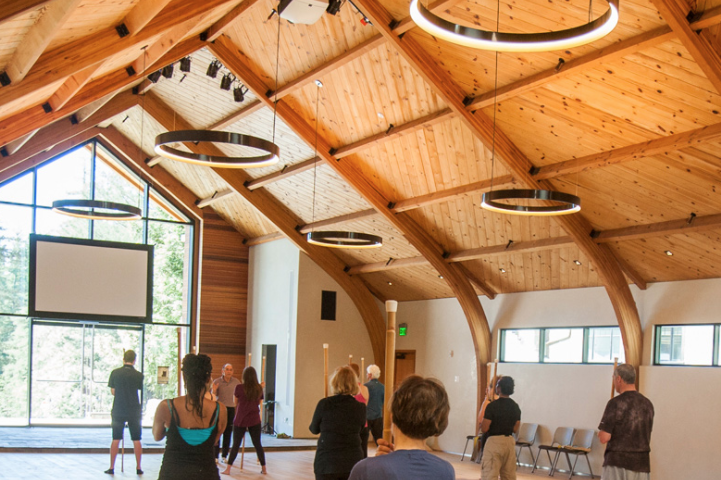 The center, which opened earlier this year, sits on a beautiful 75-acre campus in a Redwoods setting and offers short-study courses on weekdays and the weekend that aim to be transformative. The campus includes residential halls and classrooms, and is anchored by a massive post-and-beam lodge. The venture bears some similarities to Kripalu, the wellness center in Stockton, Massachusetts. Kriens chose "the backyard of Silicon Valley," as he describes it, because it fills a critical need in the community. He has a point. The tech industry is known for its work-obsessed culture and entrepreneurs who are often brilliant, but not fully developed as people. Many put off the work of building more integrated lives until later, after they've had success—if they ever undertake such work at all. "Why does all of this have to happen serially?" Kriens asked. He built jobs, created companies, and spent years on a treadmill, only to discover later on what he really wanted to get out of life. Kriens hopes 1440 will get to people in their 20s and 30s while they're just getting started in life and their careers so that they can learn these skills and lessons earlier. One of the reasons Kriens wanted to build an actual campus was because he wanted it to be a real place with a footprint. "This can't be something you read about or watch on TV... [it needs] to engage the whole person," he emphasizes. For Kriens, though, the work that happens at 1440 is only the beginning. He says one of the challenges is to bring these experiences back into the world and apply them on a daily basis. Kriens calls it the "arc of multiversity"—something that should begin well before people even arrive on campus, and continue long after they leave. The 1440 Foundation still does have a grantmaking arm. Kriens also works through an investment arm that dabbles in the "quantified self" space where companies are developing technologies like the wearable, brain-sensing headband Muse and guided meditation app Headspace. Kriens has also partnered with a relationships development program and its online suite of teachers. It's all "similar medicine," he explains, and centered around being real, true and honest about what’s happening in life. Some readers are probably clucking their tongues at this point about what the Kriens are up to with their philanthropy. With millions of children dying around the world from preventable causes each year, is nurturing personal development in one of America's richest regions really where donors should be focused? We'll leave that question to others. What's clear is that there are a lot of ways to engage in philanthropy. To some, the extraordinary diversity of donor interests is exactly what's strongest about this sector.